Lets Keep the World Green! Let nature’s gifts fill your home with health and happiness! 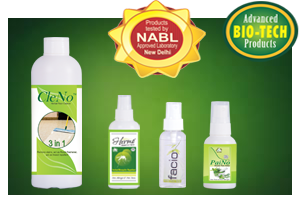 Why choose harsh chemical products that can andanger your health when there are pure, natural products From Bio Cline? We have consciously stepped away from chemicals and focussed on creating household and skin care products using nature’s abundant bounty of herbs. These are not just effective and powerful but are also completely natural with no side-effects.Bio Cline was founded by S. Prabakaran in 2012 in association with the Periyar Technology Business Incubator at Periyar Maniammai University. His vision was to use cutting edge bio technology to usher in a new era of innovative natural products. The company has a good. Don't Miss this Opportunity to meet us at Booth No: 32A Health & Beauty Expo on 13-15 June 2017 ,at Chennai Trade center. Join with us on a crazy shopping of 'Namma Madras Namma Shopping' on 7th & 8th of June @ Wesley Grounds, Royapettah Chennai. Walk in to booth No : 58 and Get Refreshed! !